It’s a risky business buying illegal drugs, and more people are turning to the dark web to do so. Accessible only through encrypted internet networks that use anonymous browsers such as Tor, online “darknet” markets offer a relatively safer — and more convenient — option for procuring illicit substances for both vendors and buyers. Despite several large darknet markets being shut down by law enforcement — including Silk Road (coined the “eBay of drugs”) in 2013 — these drug markets are continuing to grow. “More and more people are aware of the ease of accessing them, and we are seeing the number of users rise quite dramatically,” said Dana Haynie, professor of sociology and director of Ohio State's Criminal Justice Research Center. Haynie and Scott Duxbury, PhD candidate in the Department of Sociology, have been observing one of the largest darknet drug markets operating today, with a focus on the social network dynamics that sustain it. 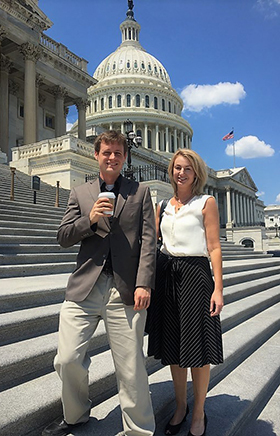 Their research was recently selected to represent the American Sociological Association at the Coalition for National Science Funding Exhibition and Reception, which is held annually on Capitol Hill to promote the benefits of federally funded science to politicians and policy makers. Haynie and Duxbury also had the opportunity to meet with the offices of Ohio Sens. Sherrod Brown and Rob Portman, as well as Reps. Joyce Beatty and Steve Stivers. “Recognizing that the senators and legislators are very concerned about the opioid epidemic in Ohio, they were all very interested in our project and excited about what we are doing,” Haynie said. Most drugs bought via darknet markets are recreational substances such as marijuana, LSD and cocaine, but there is “a significant growing market for heroin and other types of opioids,” Duxbury said, adding that heroin and heroin substances including fentanyl are now more popular than prescription opioids on the dark web. Pursuing arrests through the darknet is costly due to dealers’ carefully concealed identities and difficulties catching people over large geographic areas. But Haynie and Duxbury’s research sheds light on another possible avenue of disruption — trust. Trust between buyers and vendors is especially important on darknet drug markets, where buyers risk being scammed or sold inferior or contaminated products, Haynie said. Vendors establish trust through customer and administrator reviews like on eBay or Amazon, and without good reviews tend to have little to no customer base. “As a buyer trying to figure out who you’re going to buy drugs from, the only way to make a logical decision is to look at how other people have rated the trustworthiness of that vendor and the quality of their product,” Haynie said. "Trust ends up being this sort of informal glue that holds the whole thing together,” Duxbury added. The team hypothesizes that law enforcement efforts aimed at undermining trust may be more effective and cost-efficient than targeted arrests. Such strategies could include impersonating buyers and leaving negative reviews or “trolling” message boards where people get information about the darknet drug trade, Duxbury said. New law enforcement approaches could be critical in curbing the growth of online drug trafficking, especially with the opioid epidemic sweeping from rural landscapes into suburban ones — where more people are presumed to be using the darknet. A re-creation of the darknet drug market network Haynie and Duxbury are studying. 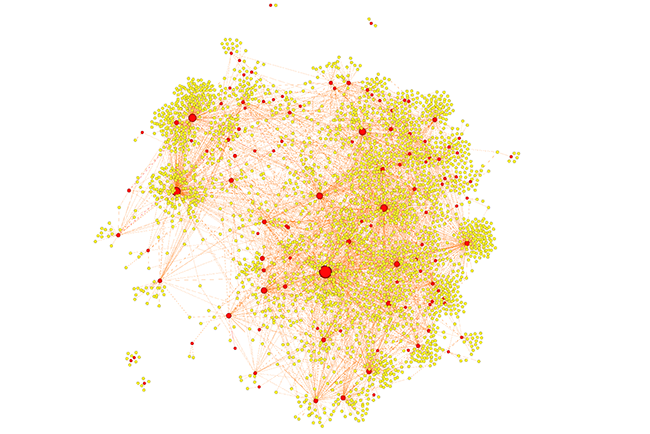 Red dots are vendors; yellow dots are buyers. Larger dots have engaged in more transactions. Data is from mid-May to mid-September 2017. Image courtesy Scott Duxbury. “Once we get a better sense of these broader picture results, we’re hoping to work with law enforcement a little bit more,” Duxbury said. Their research is made possible with support from the National Science Foundation, and collaborators Srinivasan Parthasarathy and Mohit Jangid, professor and graduate student, respectively, in Ohio State's Department of Computer Science and Engineering. “This is just the tip of the iceberg. We’re focusing on illegal drug transactions, but there is some much more horrific criminal activity occurring on the darknet,” Haynie said.